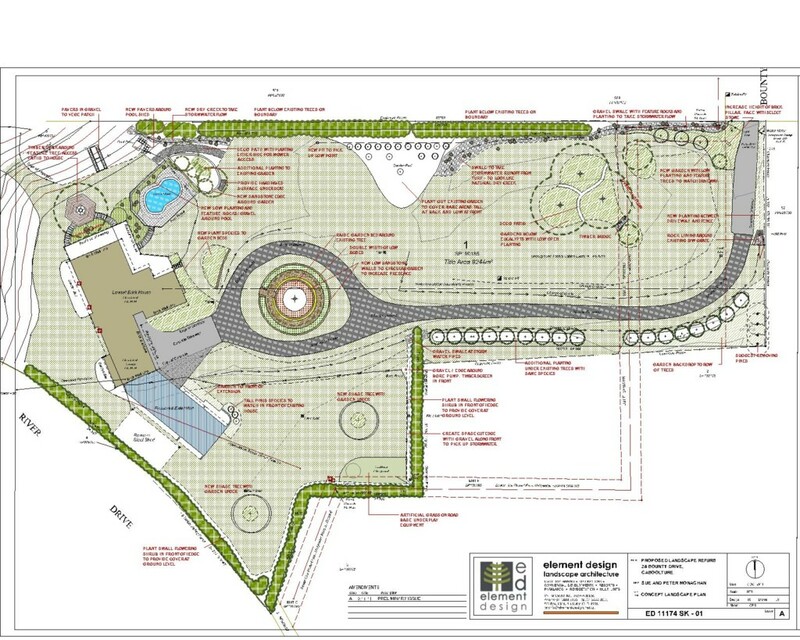 Small, medium and large scale acreage lots provide a design challenge of balancing scope of works with budget restraints. 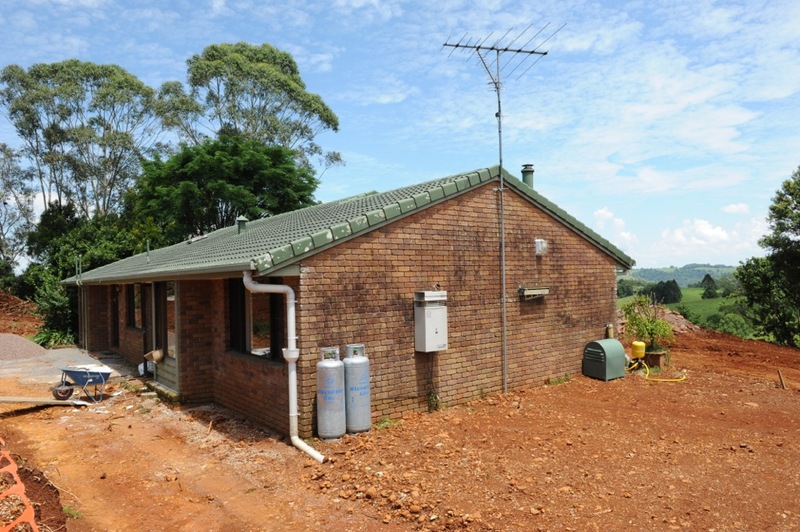 Rural residential property in hinterland regions. 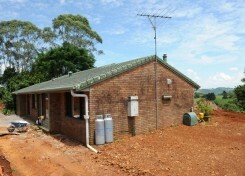 Maleny, Montville. Revegetation areas, orchards, creeks. Tree colonnades to long driveway entries. Hobby farm designs with animal enclosures. Open space grass areas for recreation and play. Views to hinterland and coastal regions. Conondale, Queensland – Award Winner. 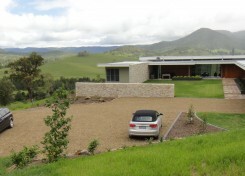 This award winning dwelling has magnificent views across the valley. 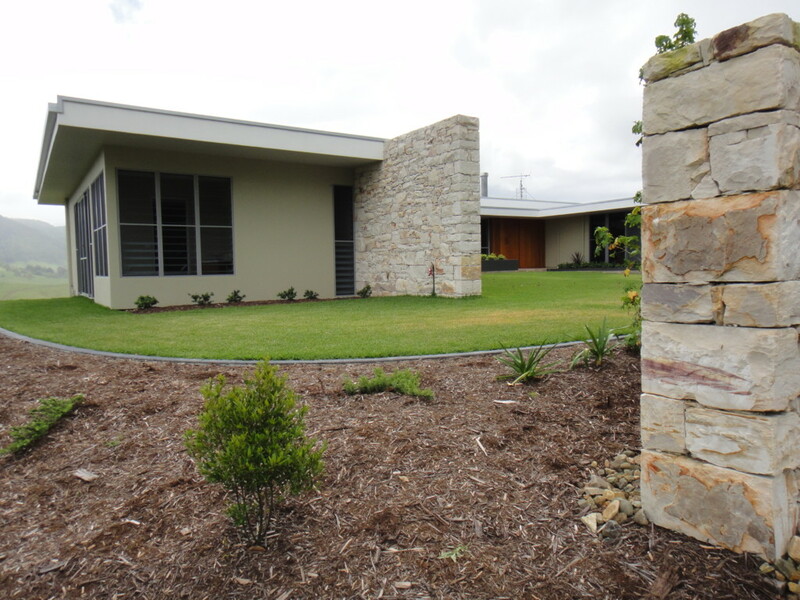 The rear of the home has a large, open court with stunning rock pitched blade walls. 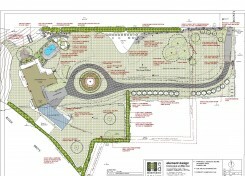 Garden edges are generally large, sweeping curves to contrast with the rectilinear building design. 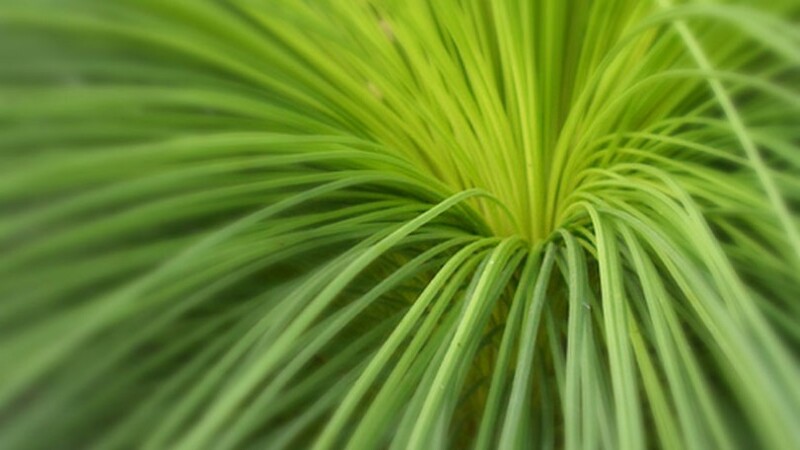 “Less is More” certainly is true for this design, with planting in mass to complement the architectural form. 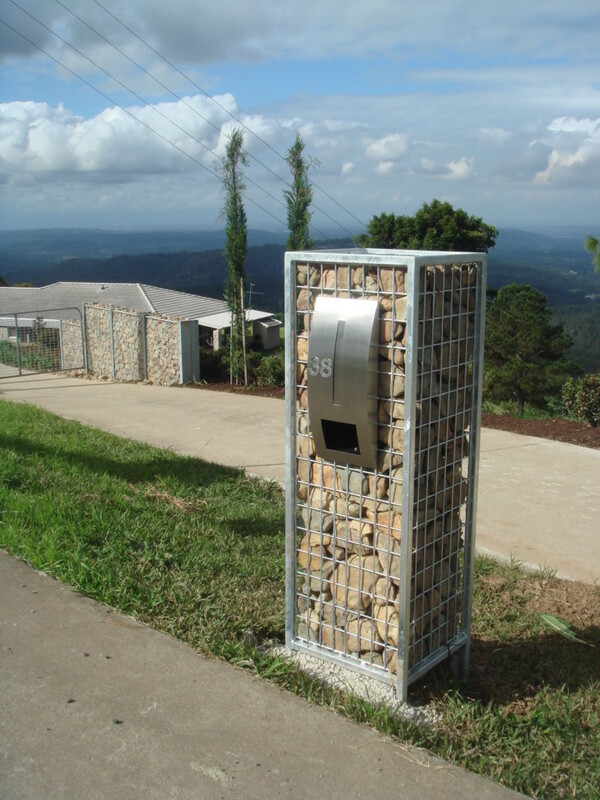 North Maleny Road, Maleny, Queensland – Award Winner. The existing Maleny dwelling was extensively renovated to enhance its north facing aspect and beautiful views down the valley. The location of the driveway and gradient towards the rear of the dwelling had produced major drainage issues. 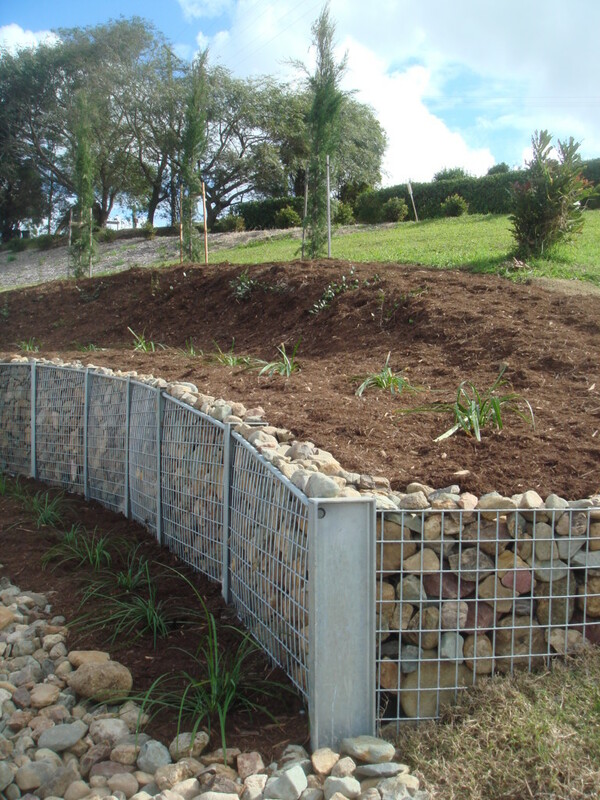 This was successfully mitigated by construction of an extensive overland and subsurface drainage system. 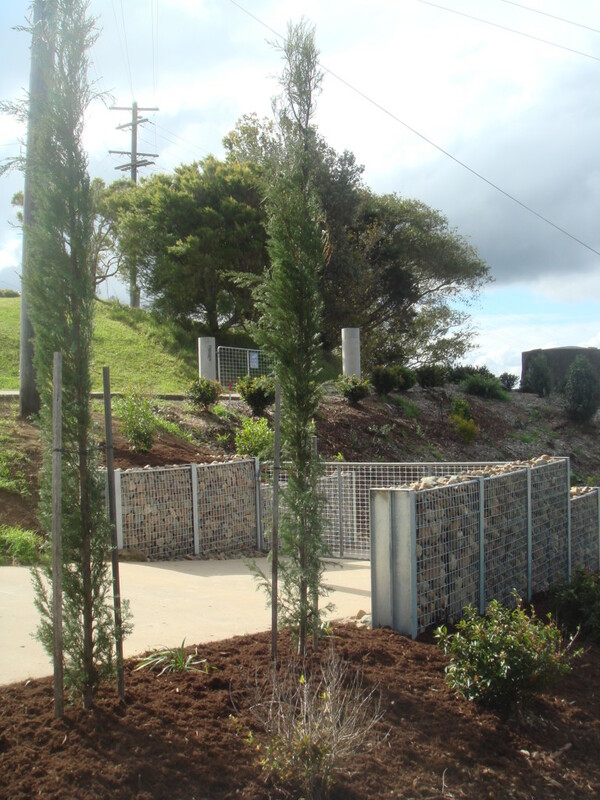 Retaining walls, feature paths and planting all assisted in making this a successful project. 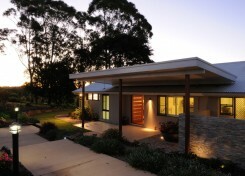 This contributed towards the building designer winning a Queensland Building Design Award in 2011. 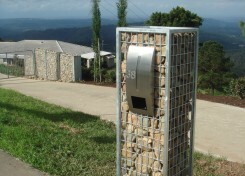 Hot dipped galvanised steel I beams and mesh have been used to form the gabion entry walls, retaining walls and letter box. 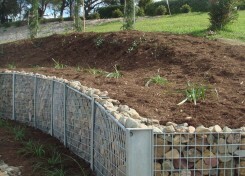 The mesh frames were then filled with rounded, oversize Mary River gravel which provides a matrix of earth tones throughout. 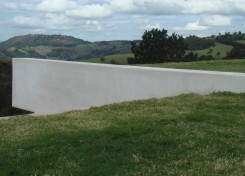 Striking blade walls support a 1700s “Ha Ha.” This frames an amazing view across rolling foothills to the coast and beyond. 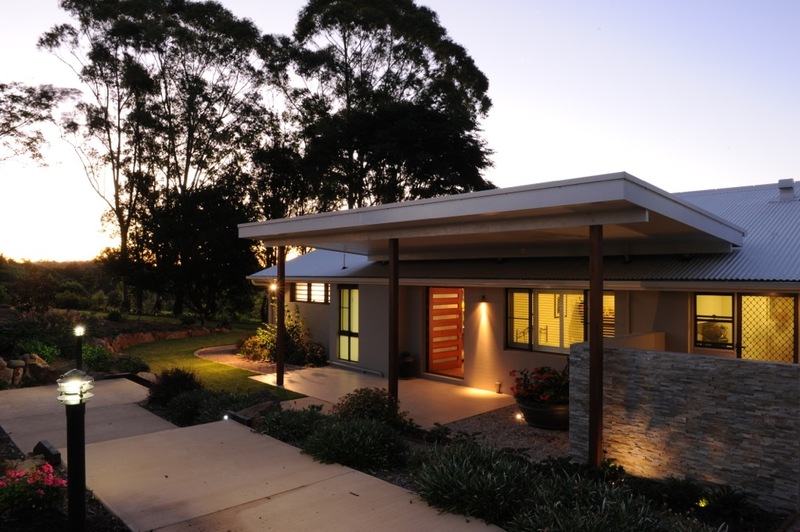 The occupants of this magnificent acreage property in Caboolture, Queensland, were looking to refresh and redesign the landscape component of the site. 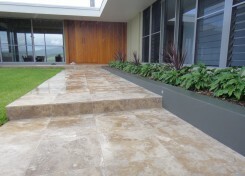 The fundamental issues of design and refurbishment were dealt with initially. These being correcting some poor drainage issues and the removal of some out of scale tree species, causing shading and invasive root problems. 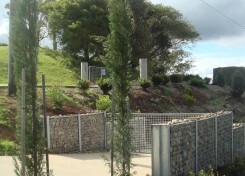 New planting areas were created around existing feature trees on the site. The main feature of the new design is the tiered sandstone feature walls surrounding the existing Jacaranda species in the circular driveway. A feature timber deck and casual seating opportunity was designed for an existing feature Leopard tree adjacent to the pool area. 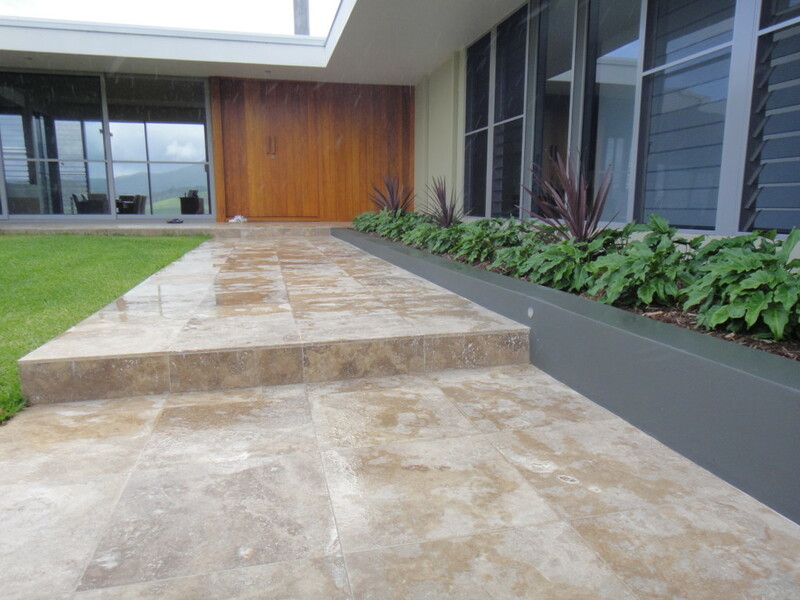 The design also improved the access and egress paths to the pool and surrounding residence, and incorporated new feature plantings to the surrounds of the pool and residence. The design in its simplicity also incorporates large, sweeping turf areas that complement the scale and grandeur of the site.